Painters depicted darkness even as the world embraced artificial light. 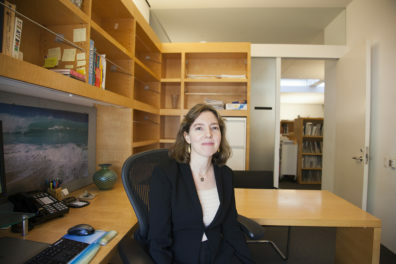 Co-published with Zócalo Public Square. For many of us in the modern world, light at the flick of a switch feels so natural that it’s difficult to imagine a time when even the meager flame of a candle was hard won and too precious to waste. But until the late 18th century, the means for lighting up our surroundings had changed little since the Pleistocene Era, when limestone vessels with their nubs of tallow and wicks of moss illuminated the walls of the cave of Lascaux. 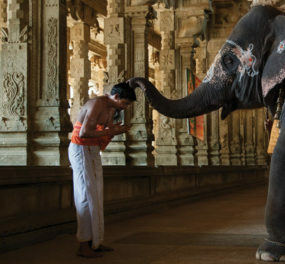 Almost all lamps, fueled with animal or vegetable oil, stank and smoked. Their flames were unsteady and difficult to keep. The night, too, changed little during those centuries. Most people in cities and towns stayed close to home after sundown, and not only out of fear of footpads and thieves. Travelers stumbled over wood and coal piles, and fell off bridges and into canals. The night was distinctly its own: immense, unknowable, and nothing like the daylit world. The 19th century brought exponential changes in light technology. In large cities, more reliable interconnected gas and electric streetlamps gave rise to vibrant public life after dark. Not only were the streets brighter; homes, shops, and shop windows became fully illuminated. Hours that had once been furtive and confined offered new freedoms as urbanites socialized, shopped, and even worked after darkness fell. Technological developments and increases in light would continue well into the 20th century, and would profoundly alter society, the sense of self, and the natural world. One way to comprehend the complexity and scope of this transformation is to look at the way artists responded to the changing night and the accompanying changes in human possibility. A recent exhibition at the Bowdoin College Museum of Art, Night Vision: Nocturnes in American Arts, 1860–1960, curated by Joachim Homann, did just that. 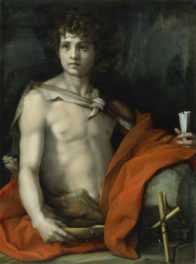 The viewer first encountered a series of paintings that testified to the power and complexity of the full moon, which for centuries had been the most reliable aid to navigation in the night. 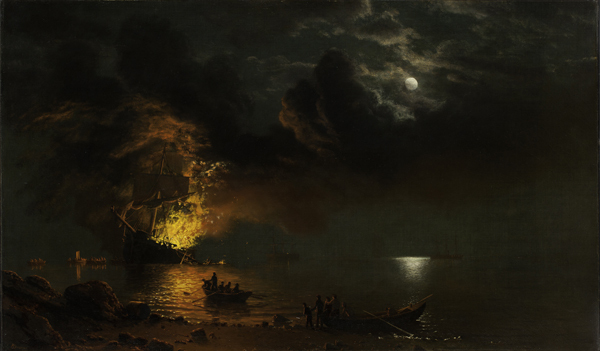 Chief among these: Albert Bierstadt’s The Burning Ship from 1869 (shown at top). Bierstadt has given over the right half of the canvas to the full moon: rational, cold, far above human affairs. Its reflection on the water is calm, too, and a far cry from the roil of human history represented on the left side of the painting. A whale ship burns after being attacked by a Confederate cruiser. The flames flare heavenward, uncontrolled and consuming. The escapees look back at what they’ve lost, and perhaps, also, are captured by wonder: There would have been almost no light brighter than that of such a disaster. In the deep shadows behind the conflagration, other ships on the water seem mere shadows navigating the unknown shoals beneath. Their backs are to the moonlight, which offers them nothing now. While Bierstadt was painting, the race for a controlled and modest electric light was on, and in 1879 Thomas Edison successfully demonstrated his incandescent bulb, its miraculous filament enclosed in glass, not subject to wind or human breath. By 1893, incandescence was evident everywhere at the World’s Columbian Exhibition in Chicago. There had never been so much human light in one place before: thousands of lamps along walkways, spotlights illuminating fountains and the shores of Lake Michigan, and hundreds of thousands of bulbs tracing the edifices of the buildings. 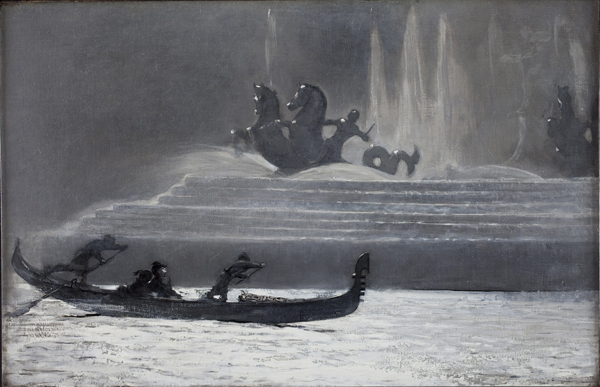 Winslow Homer’s The Fountains at Night, World’s Columbian Exposition was, at least according to his mother, “the first picture ever painted by electric light.” It is as if Homer has painted the unblinking eye of the late century staring into the future. The grave intensity of its blacks and whites and grays increases the viewer’s sense of urgency as we try to fix the gondola racing across the canvas. It seems it is we who are ephemeral; the light will never change. By the early 20th century, New York City aimed at turning night into day. Edison himself hoped for as much: “Everything which decreases the sum total of man’s sleep, increases the sum total of man’s capabilities,” he once proclaimed. “There is really no reason why men should go to bed at all.” Berenice Abbot, one of the inveterate photographers of New York City between the World Wars, recorded the city in its many aspects. Her day-lit street shots of automats, lemonade stands, tin merchants, and stoop sitters seem of their time—and firmly of the past for us looking at them now. But her photograph Night View: Midtown Manhattan captures both the city then, and the city as it was to become. Night Vision, in charting the changing complexities of light and the new mysteries of the night, also reminded us of the enduring mysteries of ancient night. 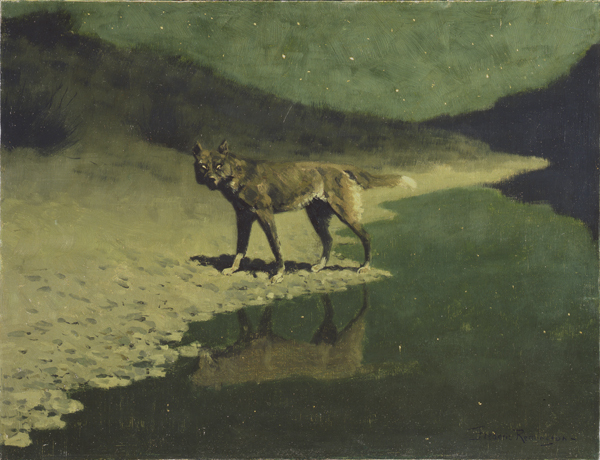 No painting succeeds at this more fully than Frederick Remington’s Moonlight, Wolf, which he painted around 1909, near the end his life. There is no moon in the frame, only moonlight, which exposes a landscape threaded between stars and starlight on water. The wolf’s bright stare, fixed on the viewer, seems to share the same substance as the stars: two piercing points, as unpredictable and unreadable as a burning ship. To look back at Remington’s wolf at a time when an excess of light obscures the stars and makes it difficult for night hunters to see their prey, is to stare into an eternal immensity. Old night, make no mistake, has not left us. My most recent book is Brilliant: The Evolution of Artificial Light. I am at work on my fifth book, The Wake of Silence, which will be published in 2018.